Does the Bible give us specifics about how a marriage is defined? If so, what is the definition of a biblical marriage? 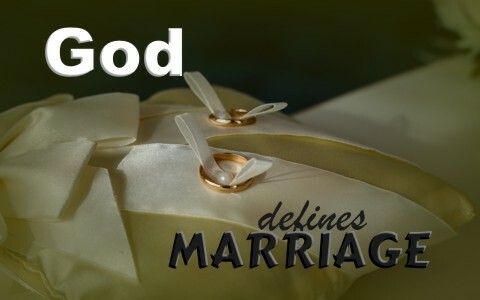 The very first marriage proves that marriage is a God-ordained institution and so it has the blessing of God. Marriage was God’s idea for He said of Adam “It is not good for the man to be alone. I will make a helper suitable for him” (Gen 2:18). Mankind was made for relationships and “the man gave names to all the livestock, the birds in the sky and all the wild animals” (Gen 2:20a) but God saw that “for Adam no suitable helper was found” (Gen 2:20b). God identified the problem and then God commenced to solve that problem and so “the Lord God caused the man to fall into a deep sleep; and while he was sleeping, he took one of the man’s ribs and then closed up the place with flesh” (Gen 2:21). Then “the Lord God made a woman from the rib he had taken out of the man, and he brought her to the man” (Gen 2:22). Two important point’s surface here; first God made woman out of the same material as man was made from and the rib would seem to indicate that he and she are to stand side by side as co-equals before God as His creations. Another point is that God then “brought her to the man.” God’s intention for the woman was to stand side by side with the man. Not behind him or in front of him but beside him. Notice that God tells us that “a man shall leave his father and his mother” but Adam didn’t have any physical father or mother so why did God say “a man shall leave his father and his mother?” I believe this is God’s intention; that man should leave their family and be joined to his wife. Clearly there is no room for homosexual relationships commanded by God whereby they can be recognized as married. Why is it God-ordained for only men and women to marry? It is because she was taken out of man not out of a woman. Only the man and the woman can become one flesh. No woman and woman or no man and man can ever become “one flesh” and be joined together to stick or cleave together as far as God defines it. The structure of this sentence is that of a command, “Therefore a man shall leave his father and his mother and hold fast to his wife, and they shall become one flesh.” It is a command for the man to leave his family and I would think this means leave his family out of the man’s new family. There should never be any interference from in-laws in this new “one flesh” family. The words “a man shall” is the very same thing as “a man will” or “a man must” and is given as the only possible option. It doesn’t allow for any other possibility like “a man could” or “a man might.” There is no room for any other two to become one flesh except the man leaving his family and being joined with his wife. The male and the female “shall.become one.” Male joins with female and only a male and a female can become one flesh. Nowhere in Scripture is it said that a male and a male or a female and a female can ever become one flesh. The only possibility of the God-ordained marriage is between a male and a female. Jesus was teaching about divorce and the Pharisees were testing Him (as usual) about allowable reasons for divorce (Matt 19:3) and Jesus reminded them of something that they should have already known that was in Genesis two; “Have you not read that he who created them from the beginning made them male and female, and said, ‘Therefore a man shall leave his father and his mother and hold fast to his wife, and the two shall become one flesh’? So they are no longer two but one flesh. What therefore God has joined together, let not man separate” (Matt 19:4-6). Here is nearly the very same thing that was mentioned in Genesis chapter two. God created them male and female and the male must leave his family and hold fast to his wife. The word for “hold fast” in the Greek is “kollaō” and means “to glue together, cement, to fasten together,” or “to fasten firmly together” so the idea is the same thing as in Genesis two. They are glued together to cleave or stick or be fastened together. The Greeks used this word for when they were gluing or cementing something together with the intent of making the bond permanent and whatever they glued together was to be considered one thing. The male and the female are now fastened or bonded permanently with one another. This “two shall (imperative, “will” or “must”) become one” is only possible when the male joins with the female. This leaves absolutely no room at all for women to be joined together to become one flesh or a male to become one flesh with another. Only a male and female must be firmly and permanently fastened to one another and only a male and female can become one flesh. There is no plan B for marriage and no other option is allowable for what God considers a one-flesh marriage. I understand that this is not very politically correct but our standard for truth is not politics, social agendas or Supreme Court rulings. Our standard for truth is the Word of God and it never changes because God never changes. Society does change but truth is firmly fixed by the Creator of those males and females and what He says is marriage in His eyes is the only marriage that He recognizes and what He recognizes is all that is important. Thank you for posting this important topic pastor Jack! I recently read in Martyrs Mirror, that many of the followers of Jesus ended up with believing wives. Of course Paul is an exception, and he wrote about his feelings and thoughts on this topic. Marriage is something I personally struggle with. I have laid down my need for a believing wife to the Lord multiple times, but for one reason or another, it always comes back to me. I feel as though if He wants me to have a wife, He would provide one for me. http://biblehub.com/proverbs/19-14.htm I continue praying that if He will not provide a wife, that He will remove my feeling of needing one. I know He hears my prayers, but I don’t understand the response. Thank you for posting this for us. Your faith admist this suffering is admirable my brother. I will join with you in praying for God’s will in this my brother. I know you must have a difficult time with this. Thank you for your prayers! I try to be content with what I have: http://biblehub.com/1_timothy/6-8.htm Thankfully, with God’s Spirit dwelling inside of me, He sustains me in my circumstances. I somewhat hesitated to post my personal struggles, that were slightly off topic of this thread, but maybe there will be a reader who will relate to my struggles. My brother…your have your fair share of burdens….but you don’t see to carry them around. He does sustain us, no doubt. I agree. I really love the content of this website its explaining very well. I got married bt after two yrs separated due to infidelty and alot of verbal abuse.from my side i disconnected and didnt do my bst in the marriage.after i left he married the lady he was seeng on the side immediatly and even took my baby whom am trusting God to reunit at God’s timing. Am still very young and would love to get married again to God fearing man who will respect me.I have also forgiven him and the lady. Advise if am on the right track. I love your humility in your comment. I believe you are doing what is pleasing to God. Being so young, you still have much of your life ahead of you. I pray God directs you to the right man who is a godly man that you might find in your church home or nearby. May God richly bless you Grace. Previous post: What Were Paul’s Missionary Journeys?